In a town where men had been the managers for more than two and a half centuries, Elizabeth Mary Nowotarski Leonard made local history in 1981 when she was elected the first woman first selectman. 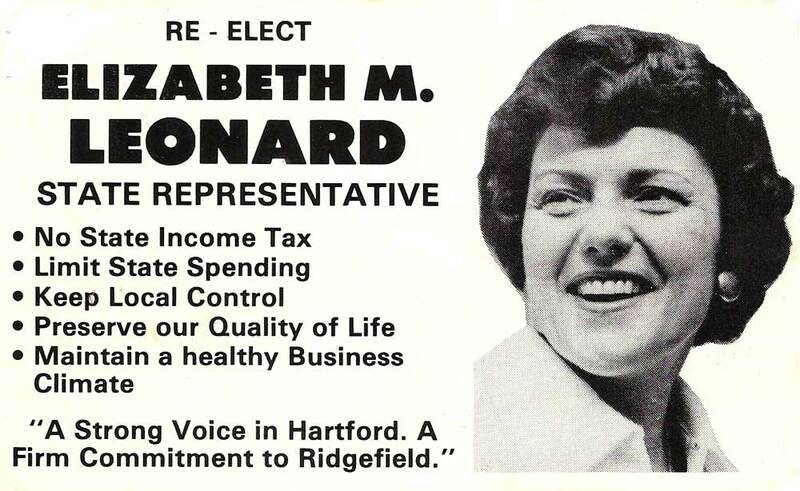 And her election wasn’t even close, for Mrs. Leonard was already widely popular, famed for her devotion to Ridgefield and its people. But ironically, the Democrat she beat was also a woman— and a pioneer in her own right. The New York City native arrived here in 1958, and worked for a decade as the Ridgefield reporter for The Danbury News-Times, often turning out six or seven stories a day. Around 1970, she turned the tables; instead of covering politicians, she became one. She left the newspaper and joined the Republican Town Committee, serving as its secretary, and also became vice president of the Fifth Congressional District Women’s Republican Club. She was named to a Charter Revision Commission, and began a long stint as a lively and witty moderator of Town Meetings. 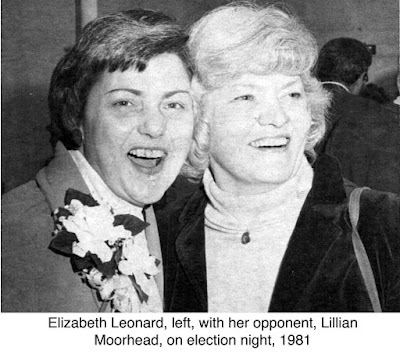 In 1976, she overcame opponents on her own town committee, in a caucus and at a primary, to win the nomination for state representative, and went on to defeat Lillian Moorhead in the election. She served in the State House till 1981, earning the nickname “Studs” for her support of legislation allowing studded snow tires. Because of her efforts for improved rail service on the Danbury line, a self-propelled Budd car was named Lizzy in her honor. In 1981 she was elected first selectman (she always preferred to be called first selectMAN because that was the traditional title for the job). The woman she beat was Lillian Moorhead again. Moorhead had been a member of the Board of Selectmen since 1973, and was the first woman to serve on that board since the town was founded 258 years earlier. During Leonard’s six years as chief executive, the town began paramedic service, built more housing for the elderly at Ballard Green, added a sewage treatment plant for Route 7, refurbished athletic fields, rebuilt schools, and began work on the Prospect Ridge congregate housing for the elderly. When she left office, the town had a $700,000 budget surplus. Ill health, including severe arthritis, forced her to retire from office in 1987, but not from the volunteer Board of Selectmen, where she continued to serve until her death in 1992 at the age of 56.